„ESPE – The First 50 Years“ tells the story of ESPE’s development from a small club of friends into an international scientific society. 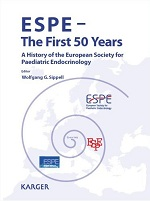 The European Society for Paediatric Endocrinology looks back on its history, major steps in the development of this new subspecialty, and how the 30 founders and the generations of scientists who followed them achieved a democratically structured professional organisation. Success in obtaining vital long-term sponsorship from the industry enabled the development of various high-level educational programmes, fellowships, postgraduate schools, international research clusters and the establishment of prestigious scientific awards. In the second part of the book 21 senior ESPE members look back in personal recollections, and tell fascinating stories of their ESPE past. The third part provides a chronological overview with key data, including the most important scientific topics at ESPE’s 50 annual meetings to date, eight of which were international Joint Meetings. These reference overviews of meetings illustrate in detail the impressive development of paediatric endocrinology in Europe and around the world.